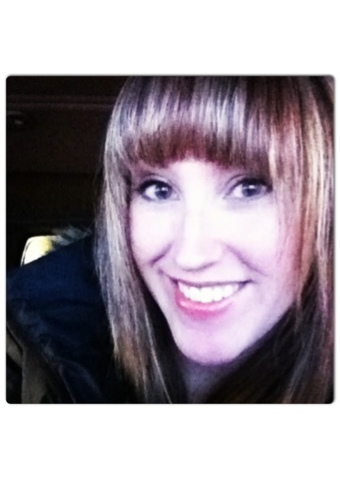 My name is Anna and I am so excited to a part of the Super Mom Tested group of amazing and inspiring women! I'm a mother of two little girls, ages 2 and 4, and find myself juggling a full time job, caring for my children, caring for my husband, and caring for myself. I'm so glad to meet you all! I wanted to share a great little tip for you. 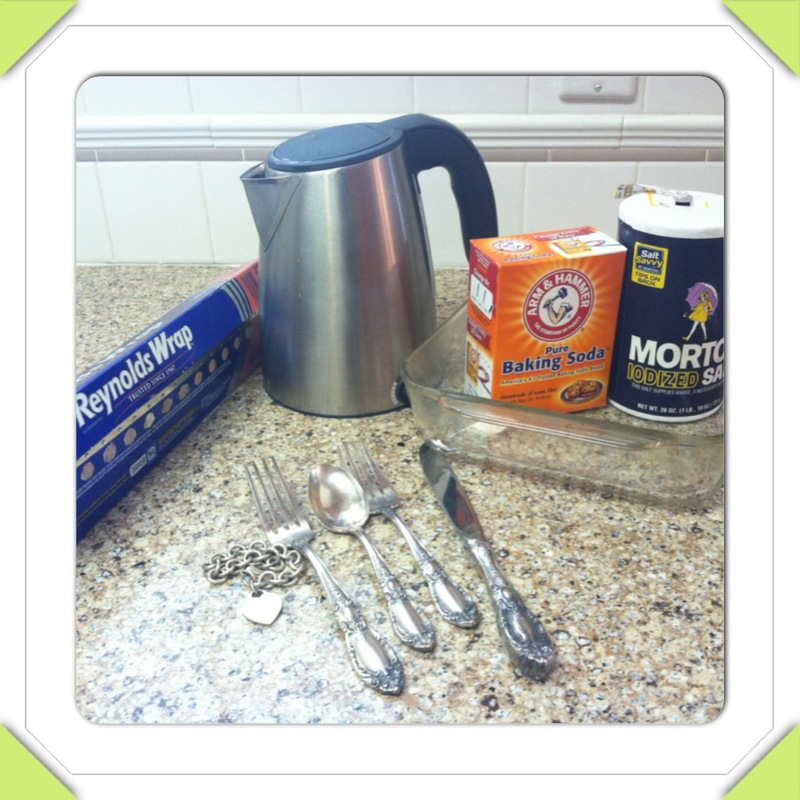 It's a safe, easy, and time saving way to clean and polish your silver. And the best part of it is you probably have all of the ingredients already in your kitchen. 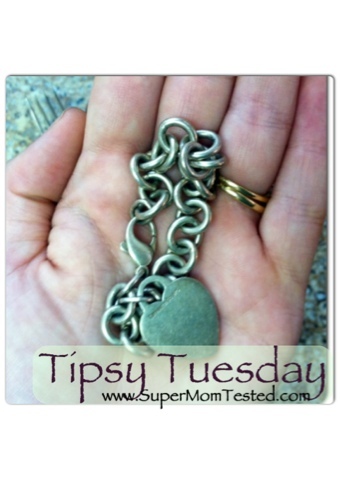 Seriously, who wants to spend all that time polishing every nook and cranny of a bracelet or piece of flatware when you can try this method. However, I found a great and easy way to get these things looking good and it doesn't take a lot of fancy stuff or ingredients! Let's take a look at the key players. First things first, line the baking dish with aluminum foil (shiny side DOWN). 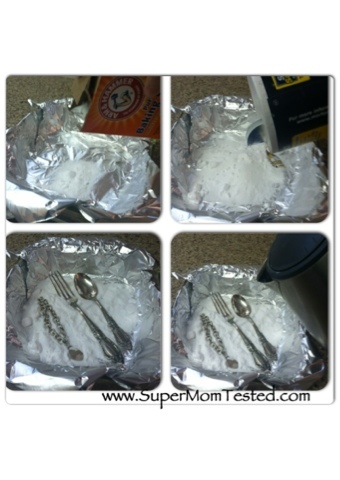 Next you want to pour about a 1/2 cup of baking soda on top of the foil. I eyeballed it. No need to measure perfectly. Put a pinch of salt in the dry mixture. Now, you want to put your silver in the powder. And finally, you want to pour about 4 cups (approximately) of boiling water in to the dish. It will bubble and foam a bit but the transformation is pretty magical. I have read if you have a particular piece that is really dirty, you can put more boiling water in the dish but I didn't need to do that. The mixture of all of these ingredients with these ingredients creates some sort of chemical reaction that cleans your silver effortlessly. Once you think your silver is ready to come out of the bath, take your tongs and pull those bad boys out of the heat. And it is HOT, so skipping the tongs would be a major bummer. Seriously, take my advice. Use a paper towel and dry them off. If you need to, you can run them under water for a second. Once they are dry, they are as beautiful as the day they were made. My little bracelet has found its way back in to my jewelry rotation. I should probably throw out the disclaimer that I am no jewelry expert but I would imagine that trying my method of cleaning silver with precious stones would probably not be advised. 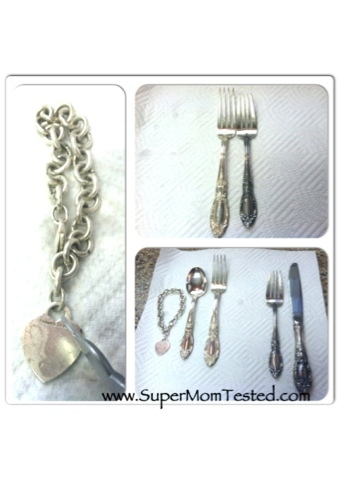 And the best way to prevent tarnished silver? Use it daily and not only for those special occasions! Until next time Super Moms! Thanks for the tutorial! I've got a few things I need to polish, I'm pinning this!